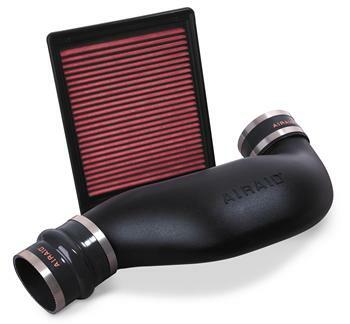 Featuring an AIRAID® Premium Direct-Fit Replacement Filter and an AIRAID® Modular Intake Tube, AIRAID® Jr. Kits help boost horsepower and mileage for those seeking a simple, economical introduction to the performance aftermarket. Custom made to fit each vehicle, the AIRAID® Jr. Kit is easy to install and requires no drilling. As with other AIRAID® Intake Systems, the AIRAID® Jr. Kit helps “straighten” and improve clean air flow to the engine for added throttle response and increased horsepower and torque. And, unlike stock paper filters, AIRAID® Direct-Fit Replacement Filters are washable, reusable and fully backed by the company’s “No-Hassle” warranty.